With money changing hands frequently during business transactions (especially during the holidays), it can be challenging for some Kelowna accountants to keep up with company finances. That’s where software like Quickbooks comes in handy. Getting real-time data has always been a challenge with desktop type software. Cloud accounting platforms like Quickbooks Online can transform your business and data processing so that you can see what’s happening now, not months later when reports are sent to you. It allows for more accuracy, more accessibility to documents/data, and helps reduce overall data entry costs so more attention is spent on structure, planning, and decision making. Kindret Business Solutions frequently uses Quickbooks to keep client invoices, bills, and more organized and easy to access. The software also makes it straightforward to manage deadlines and upcoming due dates for company billing. For those interested in specifically managing their expenses check out part one of this series on Receipt Bank. Quickbooks is primarily a financial organization tool that makes it as easy as possible to manage the financial side of a business. One of the features that stands out on the platform is the ability to learn what transactions should be categorized as through the use of AI. Don’t think something should be categorized with what the AI labeled it as? You can quickly change it yourself—helping the AI learn for the next time similar transactions occur. You’re also able to securely import transactions from your bank, and all financial info associated with it. This includes data like Paypal and credit card transactions so you have all the latest up-to-date info for your business at any given time. You can also implement time tracking with Quickbooks and more easily see how much time your employees are putting into certain projects. This can assist with understanding how long projects take (or are taking) and how much to bill out for. With Quickbooks, you’re able to see an overview of your finances and details about the most important transactions coming up that need to be dealt with. It’s also easy to customize your dashboard to your needs so you’re only ever seeing info that you want to see and be aware of. Another handy feature that’s advantageous to many people is the ability to track inventory and get notified when your supplies are running low. Quickbooks also allows you to manage multiple vendors and create purchase orders with ease. One particular feature that makes Quickbooks stand out are the reports it offers. 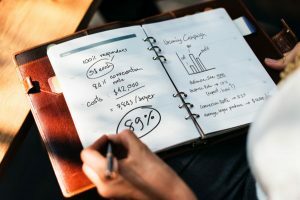 A notable report is the profit/loss report which makes it simple to see where your profits (and what percentage of your profits) are being spent on expenses. Speaking of reporting, it’s also easy to manage and stay up to date with tax info, and deductions, for both transactions and paying employees. The software also helps businesses automatically calculate taxes on each payroll date so there’s as little data entry as possible. Quickbooks can be useful for any business, and it particularly helps to save time on not only managing company finances but also data entry. Of course, getting to know the ins and outs of the software can take time that a lot of organizations don’t have. That’s where Kindret Business Solutions comes in. We can help set up Quickbooks so you can get back to spending time on improving your business, and not on your finances. Want to learn more about the best accounting software and apps to get the most out of your company? Stay tuned to our blog! If you missed part one of this series you can learn more about Receipt Bank by clicking the link. Don’t become a slave to your own brain, contact Kindret today and let us take the procrastination factor out of doing your taxes.